Barend on standby for tomorrow etd 10h00. click on Cape Long Distance Swimming bar near bottom of page and so on. My friend Barend Nortje quietly slipped away & swam the 34.5km accross False Bay - only the 4th person to do so - in a record time of 9:17:03. I suppose that’s a valid excuse for missing the regular Clifton Sunday morning swim! Visit Barend’s website at www.barendnortje.co.za for Barend’s photo’s & notes. We didn’t get very far this morning. After a 03h30 phone call confirming that the swim was on, we met at the Harbour Island slipway in Gordon’s Bay, launched the boats at 05h15 and after a 30 minute ride in darkness, arrived at the starting point at Rooi Els. We set off in relatively warm water of about 18% at a comfortable pace - it felt too slow for me, being accustomed to squad training sessions in the pool, but I was confident that Hugh - a very experienced open water swimmer - was setting a pace that he intended to maintain for the next 14 hours or 35 km. Pic 2: swimming in formation next to the cage - a "sharkproof" metal cage attached to the yellow inflatable pontoons. Captain John at the helm. The nose of the red kayak carrying the sharkshield is visible at left. We stayed in close proximity to both of these - note Hugh closest to the cage. All went well until the first "feed" after half an hour - "sixty seconds only" as per the stern Mr Tucker - after which the conditions deteriorated progressively. The chop picked up and the jellyfish seemed to be going in the opposite direction to us at high speed - "with their air brakes on" one of the crew quipped. At the 2nd break after another half hour, Hugh & the navigators on the boat called the swim off. We had been swimming into a strong current, and had been making no headway - in factwe had been going backwards. We climbed back into the boats further from our destination than we had started! Nothing left to do, but back to the harbour and a cup of coffee, before heading back to work for the rest of the day. Great Excitement - Hugh Tucker (www.hughtucker.co.za) my friend & second for my Channel swim hopes to swim across False Bay from Rooi Els to Smitwinkel bay tomorrow (see Google Earth map below). I am one of the swimmers who is on standby to second him. This is significant because, in spite of about 20 attempts at the crossing, only three attempts have ever been successful. 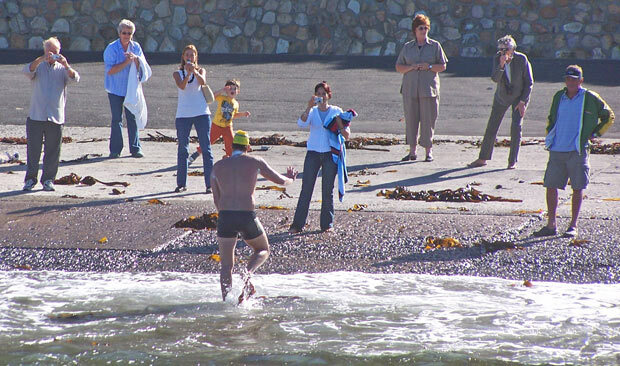 The locals regard this swim as more difficult than the English channel crossing - indeed even the most experienced local swimmers regard the swim as absurd (see http://www.capeswim.com/falsebay.htm). Personally, I need to complete a 6 hour cold water swim to qualify for the English Channel swim - and this will be at least a 12 hour swim - I therefore won’t swim the whole distance. More importantly, it is reciprocation for the time & enthusiasm that Hugh has shown to my swimming; I hope that the company & the tempo help, but I have no doubt that I will be told otherwise while in the water, if either are not contributing! The swim accross False Bay is an extreme expedition swim, due to its distance, cold water, strong currents, unpredictable weather and the presence of sharks, and Hugh has constructed a motorised cage for "shelter" if necessary. This swim is the culmination of years of long distance swimming for Hugh, which included a nearly-completed Channel swim 32 years ago, and a successful Channel swim 2 years ago. A possible swim was called off on the day 3 weeks ago due to local wind conditions, and the extended stand-by state wreaks havoc with everyone’s sleeping habits. As usual, the weather determines if we get in the water, and 16h00 is the next weather check (see www.windguru.com). Final confirmation of the swim will be at 03h00 tomorrow morning, and we will meet at the Gordon’s Bay boat club at 05h00 to motor to the starting point. The next generation: Kira being shown around the yard by Jake. She has since grown into an absolute hooligan! As you can see, she settled right in.